This topic is all about the ocean and beach. 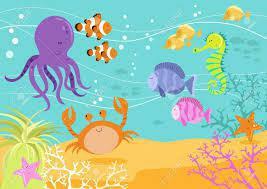 The children will firstly be taken on an underwater adventure exploring a variety of underwater creatures. The children will have an exciting opportunity to handle real sea life creatures in school, experiencing how they feel and look. We will create underwater fact books, sea creature passports and wanted posters for sharks! The children will go on sea creature hunts outdoors finding number bonds to 5 we will look at a variety of ocean related stories. Children will then focus on the beach looking at typical seaside traditions and the features of a seaside town. The children have had a fantastic week learning all about 'Under the sea' as a start of their topic Seaside Senstaion. The children were able to explore real sealife creatures looking at their features and how they felt. 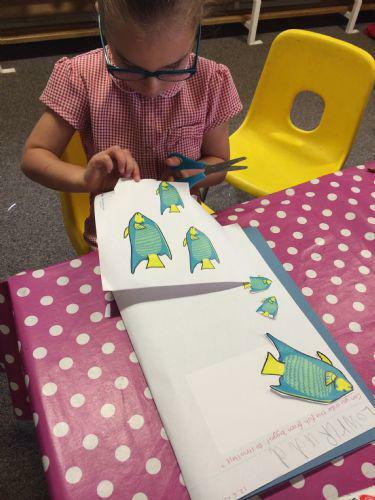 The children have created Sealife fact books that are now in our under the sea role play area to help the Nursery learn about different sea creatures. The children have also enjoyed exploring the new features within the outdoor area such as the digging patch and mud kitchen where they were making seafood cocktails and mud fish! This week the children have been busy again learning even more about under the sea. They have been sorting 'sh' and 'ch' words related to the sea, writing about the visit from the sea creatures last week as well as measuring and ordering different sized fish from biggest to smallest. We are working hard to encourage the children to read every day, remember to return their home reading books on a Wednesday for them to be exchanged by Friday.